Film clips will have text that is copyright as are all of the images, images are owned and are copyright of third parties. They are reproduced by the kind permission of their respective owners. You may view the site and download parts for personal viewing but you are not to copy and reproduce any part without our permission. Any infringement of these rights will be pursued. Please note that SSAFA will help Ex Servicemen who have a problem, its no good going to your old Regt.HQ. they do not have funds to help. He lives in Florida and is an active member of Ocala-Marion County Veterans Memorial Park. You can mail Ken who would be delighted to hear from any veterans in UK. 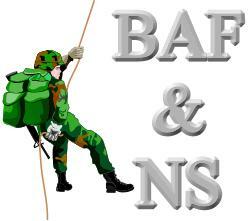 The premier site for everything you want to know about the British Armed Forces and National Service. Grandad probably travelled in one of these - find his troopship or of his aircraft ! 2500 Badges in 48 Galleries ! Please Email webmaster and tell him about broken links. by Webmaster as tribute to Neville Duke R.I.P. by Webmaster as tribute to Joseph aged 17. Bogan's Heroes and a whole lot more. Operation Varsity - The Rhine Jump 24th March 1945. No other Service but the W.R.N.S. by Muriel C. Currie MBE. Doug has updated his article as his trip to Australia had an amazing coincidence for him. Note: Download and Install at Your Own Risk ! Information on Service Records and obtaining medals etc. The badge is available to all Merchant Navy Seafarers and fishermen who served in a vessel at a time when it was operated to facilitate military operations by HM Armed Forces at any time. Copyright 2002 , 2003 - British Armed Forces and National Service Friday, August 17, 2012->, June 5, 2011 :: Best Viewed in "Any Size"